Welcome to Season 3 of The Merriweather Council Podcast! At the start of every season, I like to reintroduce myself and The Merriweather Council as a whole. Since I have done that twice already, but still wanted to do it in some way again, I’m giving you a fuller explanation of my ideal world vision and how you are a part of it to kick season three off. In this episode, you’ll hear me explain my ideal version of the world and how the people in it operate specifically when it comes to matters of art and design and craft. This episode was a bit of a struggle to record. I’ll be honest, it has been hard for me to put this into words that made sense for quite some time. In many ways, I didn’t realize this was actually a thing for me – I didn’t realize the close connection between the work I am doing here at Merriweather and my ideal world vision until pretty recently! It’s been a real thrill to be able to work in a way that helps me achieve the ideal world vision I have, especially because it connects me to so many amazing people, like you! 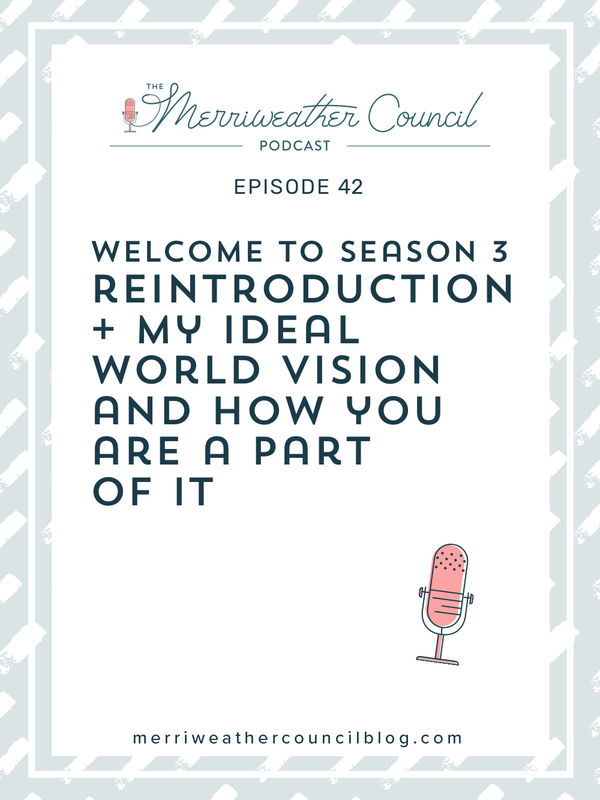 Of course, I wouldn’t open the season without giving you a bit of insight into what to expect from season three of The Merriweather Council podcast. So tune in and hear all about what I have planned for the upcoming episodes! Thank you so much for listening to the podcast! If you enjoy this or any other episodes, please share them with your maker friends! Be sure to subscribe to the podcast in iTunes as well so new episodes will queue right up as they are released!